Clubs, Manufacturers, Suppliers, in fact if it's bike related Get it listed on MBT! 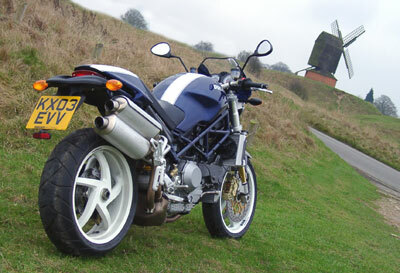 2004 Ducati Monster S4R - a two wheeled Shelby Cobra on heat! I had desperately wanted to ride the S4R Monster ever since I first saw it about a year ago. Fortunately I got a chance to have one of these stunning bikes from Ducati, but it was over Christmas and the New Year so the weather sort of limited me to what I could do with it. 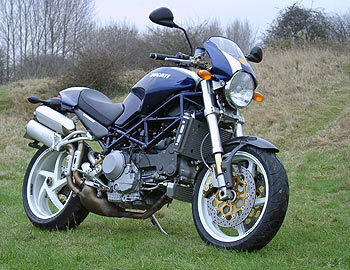 I collected the gleaming S4R Monster from Ducati in Coventry on a sunny, but cold and icy day. I decided to collect it by trailer, so first impressions had to wait until I could actually take it out on the road without falling off! A couple of days later I got my first chance to go out on a dry day. The roads were good, they were pretty empty and the once leafy and green Oxfordshire lanes opened up into the distance - suddenly the Ducati Monster S4R made perfect sense to me! I wound the throttle open for the first time, and the most powerful production Monster yet surged away with enough grunt to almost bend its fancy new one-piece aluminium handlebars. This is one seriously fast bike I said to myself, trying to hang on with grim determination! Seconds later as I changed into 5th gear I suddenly realised that I had just past the 130mph mark and it was still accelerating hard! Now this is not surprising as the desmo motor, until recently, powered the top of the line supersport 996 series But take a good look around the S4R and you will notice a number of things that stand out to make this bike something really special. 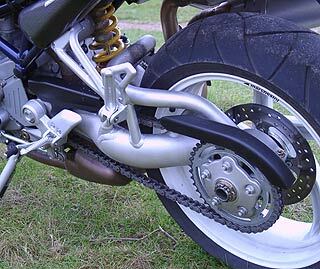 Take the single sided swing-arm for instance, in essence very similar to that found on the MH900e Hailwood bike. It's as stiff as the old twin-sided version and the same weight, but Ducati have added this for pure style and not performance. It's a beautiful creation and is truly impressive to look at, I don't know what it actually does for the bike, but hey it looks very cool! Go around to the other side and take a look at those twin stacked pipes, they look fantastic and actually sound good as standard to! We have carbon trim all over the place, carbon front mudguard, radiator side guards, desmo valve gear covers, side panels, etc, etc. 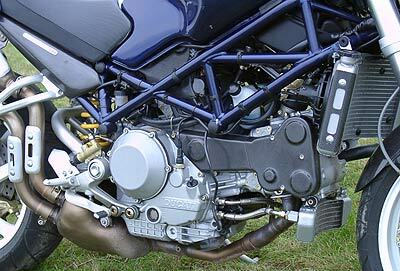 No this bike is not just about a bigger engined Monster, it's a design statement by Ducati, and a great one at that. The Monster concept has evolved gloriously over the past 10 years, and the new S4R is a far more aggressive machine than all its predecessors put together. Like the previous S4 and every other Ducati, the frame is a beautiful colour coded tubular-steel trellis creation, but now many of the bolt-on bits are new to the S4R. Up front you now get new 43mm inverted Showa forks with titanium-nitride coating and better internals, together with a fully adjustable Showa rear shock. The new footrests have been placed 70mm closer together to give increased ground clearance on cornering, and the passenger pegs now mount on separate hangers, allowing easy removal for track days. In the engine department the mods have been kept pretty modest and have been limited to the intake and exhaust. A larger airbox from the Monster S4 teams up with shorter intake trumpets to give the S4R even more added grunt. The peak power is a claimed rear-wheel output of113 bhp at 8750 rpm--12 hp up on the S4, worlds apart from the original M900's claimed 73 bhp rear-wheel output! Most riders seem to buy the Monster for around-town use as much as anything else, but here the S4R is far more demanding and less at home than its lesser powered or more user friendly stablemates. The S4R has a slightly higher seat height, and higher footpegs, but the riding position is not uncomfortable in town due to the higher and wider bars, reasonable steering lock and its fairly upright riding position. Where it falls down as a town bike is as much to do with the nature of the engine and it origin. No one can say that the 996/998 is a good town bike, liken this to the S4R engine characteristics, and you have one and the same. The fuel-injected S4R doesn't have an automatic "choke" (there's a lever on the bar), which in town makes the big Monster feel a bit hungover from cold or low winter temperatures. The clutch has to take a lot of punishment and has to cope with shed-loads of torque and power from the S4R, therefore in town it feels heavy after a while, this coupled with a little snatchiness at low revs from the fuel injection makes it a bit hard to cope with heavy traffic and slow town riding. But...As you exit the town and hit the open road all those urban frustrations instantly disappear when you open that throttle wide. Now the Monster takes on a different guise, suddenly it comes alive with raw power and torque, that legendary Ducati handling takes over, and out of those twin stacked cans comes the noise of a v-twin on song. The S4R with its extra horsepower and increased torque charges smoothly through the midrange and on to its 10,500-rpm limiter without the slighest hesitation. As you gain speed clutchless changes are a pleasure with this super smooth gearbox (one of the best I have ever used on any Ducati), and suddenly you find yourself hitting speeds usually reserved for fully faired superbikes. The oly problem at these sort of speeds is neckache, that tiny little flyscreen cowl really does work but its just not enough to sustain any real speed for long. Still it's worth a few aches and pains to ride the Monster up there with the fast boys, and embarass a few while your'e there!! The S4R is a rev-hungry bike, it loves to be nailed off the lights, off roundabouts and out of corners, in fact it just loves to be nailed everywhere!! The S4R is exceptionally good on average roads and twisty lanes thanks to the super rigid trellis frame, racy steering geometry and fairly firm Showa suspension, it cope well with just about everything thrown at it. Weighing in at around 188kg, the Monster is reasonably light, and with those wide bars and fairly upright riding position it gives you plenty of leverage for flicking through as many turns as you can find. I could not fault the handling on the Monster S4R, on every occasion I rode it it still surprised me just how capable this bike was, now if only I can get hold of another one for the summer!! If there is any comparison to be made with any other bike then it has to be with the Aprilia RSV Tuono, but there lies a different story. The Monster S4R is in a league of its own when it comes to styling, performance, handling and sheer street cred. 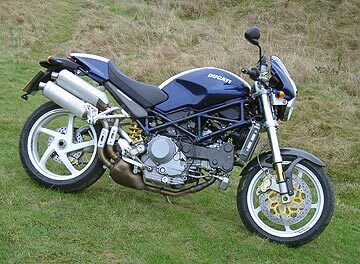 People look at you on this bike, they listen to the beat and the rasp of a well tuned V-twin and instantly recognise it as a Ducati. Like a Harley-Davidson it has an unmistakable sound to it, but in the case of this Monster, the looks are unmistakable also. Get on one, ride off on it and instantly you realise you are on something special, something that has a pedigree and it's a pleasure every time you do it, no matter how long you have it you will enjoy every minute of it. Every time I had the opportunity (considering the winter weather) to give it some stick, I gave it some, and every time I did it brought a smile to my face, the S4R was brilliant fun. If I was to compare it with any other form of pure transport fun then it has to be likened to a two wheeled Shelby Cobra. It has a definate presence on the road, hugh amounts of pure power and torque, unique looks and draws a crowd wherever it stops, it's true fun whatever the weather! Those of you seeking a naked bike for commuter or town duties should probably shy away from this Monster considering its low-speed manners, but get it out on the open road and the S4R is far and away the best Monster ever. It provides all the style and speed you'll ever need, it's a true trackday weapon and gives you as much hooligan appeal as you want..Oh and did I mention it wheelies..everywhere! !